Aerosol particles indirectly influence the radiation budget by affecting cloud microphysics and their lifetime [Lohmann and Feichter, 2005]. A poorly understood process is the aerosol induced (heterogeneous) ice formation [Cantrell and Heymsfield, 2005]. While below -38°C homogeneous ice formation takes place, i. e., spontaneous ice formation in supercooled liquid water droplets at high ice supersaturation levels without the need for ice nuclei [Heymseld and Sabin, 1989; Koop et al., 2000; Ansmann et al., 2009], aerosol particles can act as ice nuclei by offering a pre-crystalline structure for aggregating single water molecules that enables the nucleation of ice crystals already below 0C [Lundheim, 2002]. Ice crystal formation starts in supercooled clouds under most favorable temperature and water-vapor conditions that is usually given at cloud top. After nucleation, ice crystals grow fast and immediately start to fall [Song and Lamb, 1994]. Thus, they become visible as virgae below cloud base. As a consequence of this sedimentation effect and possible secondary ice production, it is important to observe the entire cloud when studying heterogeneous ice nucleation effects. Ground-based polarization lidar observations have the advantage that the cloud top can be resolved, if the cloud is optically not too thick, and simultaneously cloud virgae can be studied with respect to the phase to unambiguously identify ice nucleation in clouds. At TROPOS worldwide ground-based lidar observations have been used to investigate the heterogeneous ice formation in dependence of the aerosol conditions. Recently, coincident cloud-radar observations were added with a benefit for a larger range of cloud types. 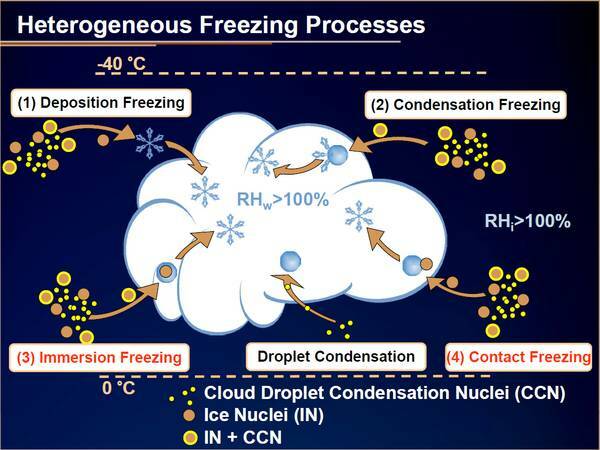 Illustration of heterogeneous ice-nucleation processes taking place between -40 and 0°C. Contact-freezing nucleation and immersion-freezing nucleation require the liquid phase to occur and are thus the favorable subjects for remote-sensing observations. To determine the phase-state within a cloud we analyze the depolarization of light caused by the cloud hydrometeors. This approach is based on polarization-lidar technique. Every observed cloud can be characterized as liquid-water or ice-containing cloud. The cloud base, cloud top, and cloud horizontal extent are stored in a database and combined with meteorological standard parameters. In this way, the fraction of ice-containing clouds can be investigated in terms of temperature, relative humidity, and others. On top, the lidar measurement serves for the determination of the current aerosol conditions. We performed a series of studies regarding the role of desert dust and tropical aerosols in heterogeneous ice formation [Ansmann et al., 2008, 2009; Seifert et al., 2010]. In addition, the impact of volcanic ash was investigated as well during the eruption period of the Eyjallafyöjükoll in 2010 [Seifert et al., 2011]. Three additional cloud data sets, each covering four months of observations, were recorded with a lidar at Punta Arenas (53°S), Chile, at Stellenbosch (34°S, near Cape Town), South Africa, and aboard the research vessel Polarstern during three north‐south cruises from 2009 to 2010. By comparing these observations with the 11–year cloud data set measured with our MARTHA lidar at Leipzig (51°N), Germany, the occurrence of heterogeneous ice formation (as a function of cloud top temperature) for very different aerosol conditions in the northern and southern hemisphere was investigated. Large differences in the heterogeneous freezing behavior in the mostly layered clouds are found. For example, <20%, 30%-40% and around 70% of the cloud layers with cloud top temperatures from -15°C to -20°C, showed ice formation over Punta Arenas, Stellenbosch, and Leipzig, respectively. The observed strong contrast reflects the differences in the free-tropospheric aerosol conditions at northern midlatitudes, that are controlled by anthropogenic pollution, mineral dust, forest fire smoke, terrestrial biological material and high southern midlatitudes with clean marine conditions. Fraction of ice‐containing clouds over Punta Arenas (black, December 2010 – January 2011), RV Polarstern (green), Stellenbosch (orange), Leipzig (red), and Cape Verde (blue) as a function of cloud top temperature (for 5-K intervals). Error bars indicate the statistical uncertainty [Seifert et al., 2010]. 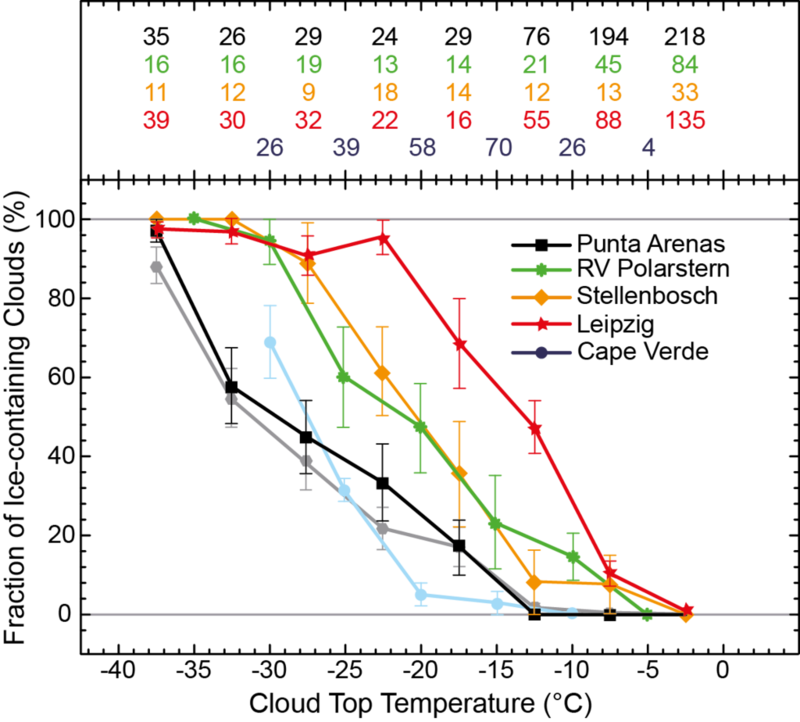 The total number of clouds within each temperature interval are given at the top (Cape Verde from Ansmann et al. ). The analysis of the lidar data set of PollyNet with it's semi-global coverage is ongoing. Currently, we focus on the analysis of data for the Amazonas basin and Beijing (China). These data sets will allow to compare heterogeneous ice formation under rather clean, undisturbed conditions (Amazonas) with the respective one in an atmosphere that is strongly influenced by mineral dust and anthropogenic pollution (Beijing). In addition, TROPOS, is involved into the EU-project BACCHUS to investigate the role of ice formation by biological aerosol particles. Ansmann, A., M. Tesche, P. Seifert, D. Althausen, R. Engelmann, J. Fruntke, U. Wandinger, I. Mattis, and D. Müller (2009), Evolution of the ice phase in tropical altocumulus: SAMUM lidar observations over Cape Verde, Journal of Geophysical Research, 114, D17208, doi:10.1029/2008JD011659. Ansmann, A., M. Tesche, D. Althausen, D. Müller, P. Seifert, V. Freudenthaler, B. Heese, M. Wiegner, G. Pisani, P. Knippertz, and O. Dubovik (2008), Influence of Saharan dust on cloud glaciation in southern Morocco during the Saharan Mineral Dust Experiment, Journal of Geophysical Research, 113, 4210, doi:10.1029/2007JD008785. Cantrell, W., and A. Heymsfield (2005), Production of ice in tropospheric clouds: A review, Bulletin of the American Meteorological Society, 86, 795-807, doi:10.1175/BAMS-86-6-795. Kanitz, T., P. Seifert, A. Ansmann, R. Engelmann, D. Althausen, C. Casiccia, and E. G. Rohwer (2011), Contrasting the impact of aerosols at northern and southern midlatitudes on heterogeneous ice formation, Geophysical Research Letters, 38, L17802, doi:10.1029/2011GL048532. Lohmann, U., and J. Feichter (2005), Global indirect aerosol effects: A review, Atmospheric Chemistry and Physics, 5, 715-737, doi:10.5194/acp-5-715-2005. Lundheim, R. (2002), Physiological and ecological significance of biological ice nucleators, Philosophical Transactions of the Royal Society of London. Series B: Biological Sciences, 357, 937-943, doi:10.1098/rstb.2002.1082. Sassen, K. (2005), Meteorology: Dusty ice clouds over Alaska, Nature, 434, 456, doi:10.1038/434456a. Seifert, P., A. Ansmann, I. Mattis, U. Wandinger, M. Tesche, R. Engelmann, D. Müller, C. Perez, and K. Haustein (2010), Saharan dust and heterogeneous ice formation: Eleven years of cloud observations at a central European EARLINET site, Journal of Geophysical Research, 115, D20201, doi:10.1029/2009JD013222. Seifert, P., A. Ansmann, S. Gross, V. Freudenthaler, B. Heinold, A. Hiebsch, J. Schmidt, F. Schnell, M. Tesche, U. Wandinger, I. Mattis, and M. Wiegner (2011), Ice formation in ash-influenced clouds after the eruption of the Eyjafjallajökull volcano in April 2010, Journal of Geophysical Research, 116, D00U04, doi:10.1029/2011JD015702. Song, N., and D. Lamb (1994), Experimental investigations of ice in supercooled clouds. Part 1: System description and growth of ice by vapor deposition, Journal of the Atmospheric Sciences, 51, 91-103, doi:10.1175/1520-0469(1994)051h0091:EIOIISi2.0.CO;2.